How might we promote procedural justice through digital services? Courts are difficult places to navigate. 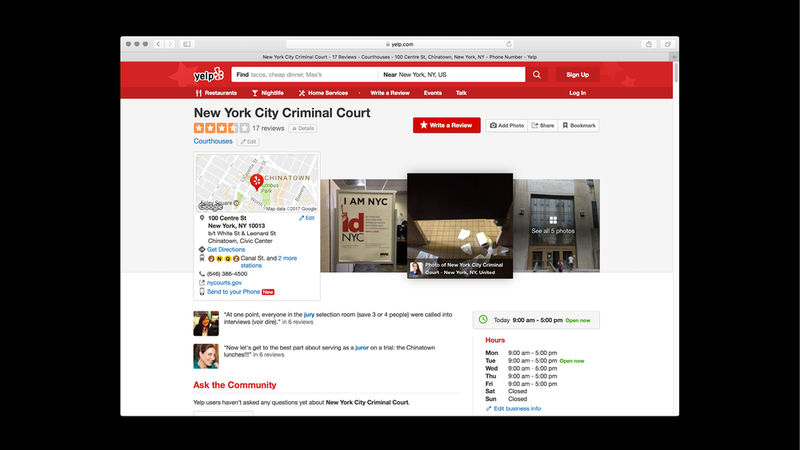 Using 100 Centre Street, Manhattan Criminal Court, as a case study, I designed Court Guide, an app that helps court users navigate the court system. 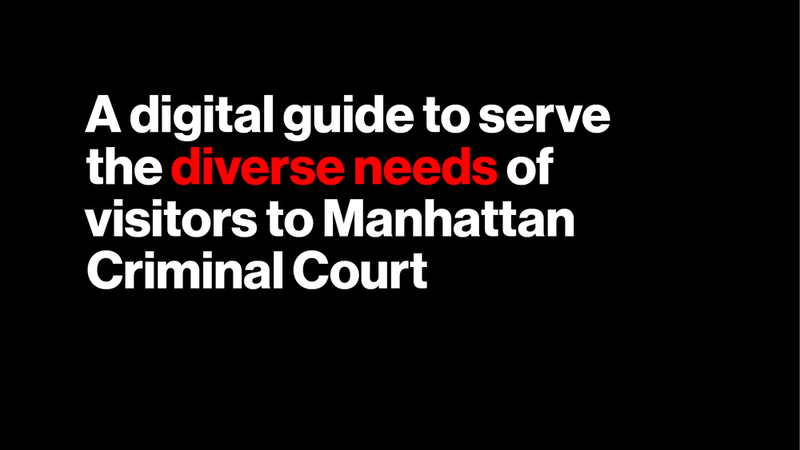 Serving their diverse needs, the app provides logistical, technical, and preparatory information, with the goal of increasing procedural justice. 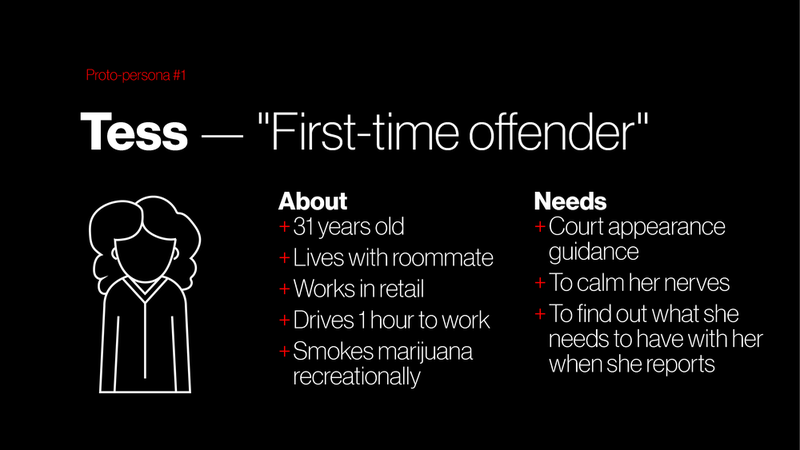 The app imagines four primary personas: jurors, defendants, visitors, and volunteers. While the court system does not presently provide any volunteer opportunities, I also am using this prototype as a means of proposing a number of functions that volunteers could take in pursuit of enhanced procedural justice. Whether one is called for jury duty, must appear for a hearing, or simply wants to see the judicial system in action, visiting a courthouse raises lots of questions. How do I get there? What should I bring? What will happen there? How long will I be there for? Who will I be interacting with? What are my rights? Currently, it’s hard to find this information online. The best resources are the official court website, which is comprehensive, but hard to parse, or Yelp, which is useful, but not particularly trustworthy. 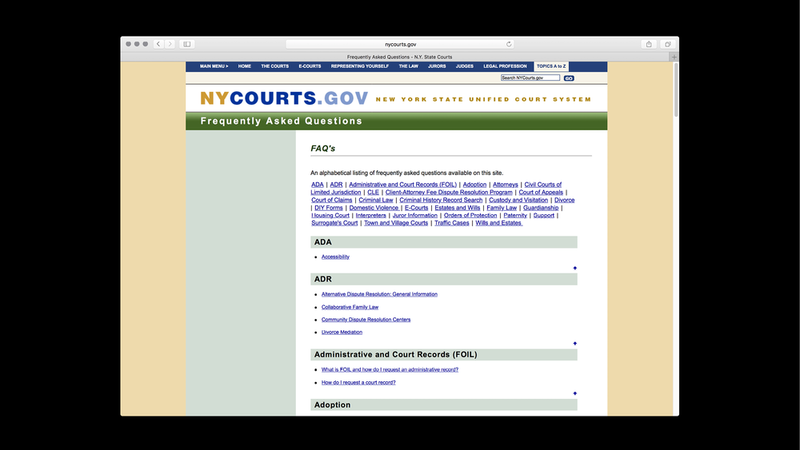 Court Guide seeks to pre-empt many of these questions by providing detailed and comprehensive materials for any court user. 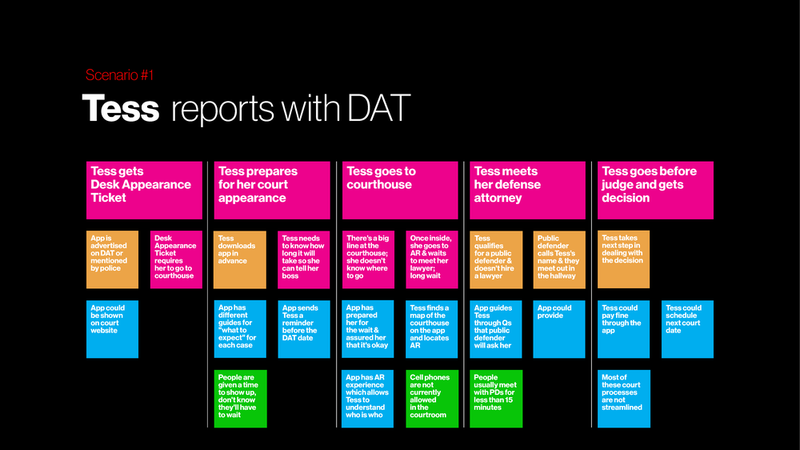 The app imagines four primary personas: jurors, defendants, visitors, and volunteers. While the court system does not presently provide any volunteer opportunities, I am using this app as a means of proposing a number of functions that volunteers could take in pursuit of enhanced procedural justice. The theory of procedural justice posits that increasing court users sense of fairness of the process will build trust and reduce recidivism. Showing respect, giving voice, increasing transparency, and ensuring impartiality are the main mechanisms by which to promote procedural justice. 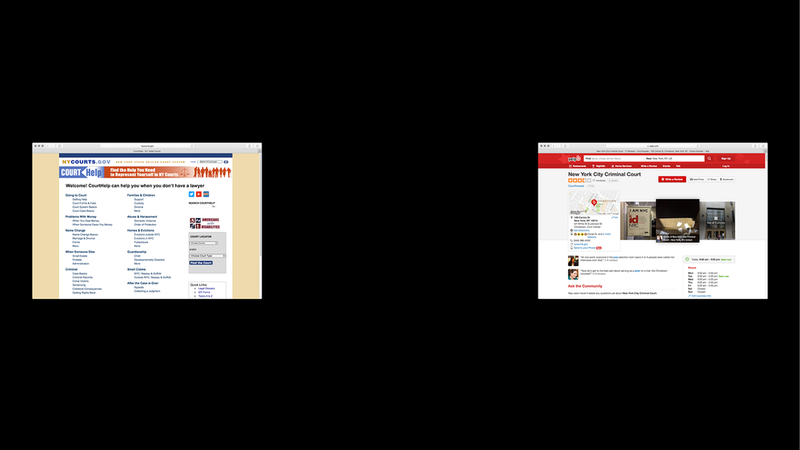 The different users have some overlapping concerns—how to get there, who they’ll encounter—and others that are tailored to their specific experiences. While traditionally procedural justice is thought of exclusively in relation to the defendant’s experience, Lindpaintner believes that by serving jurors and visitors, trust in the system could be built at a broader level. Tom Tyler, a leading researcher in the area, identifies four key tenets of procedural justice: being shown respect, feeling able to participate, and perceiving the process as neutral and trustworthy. 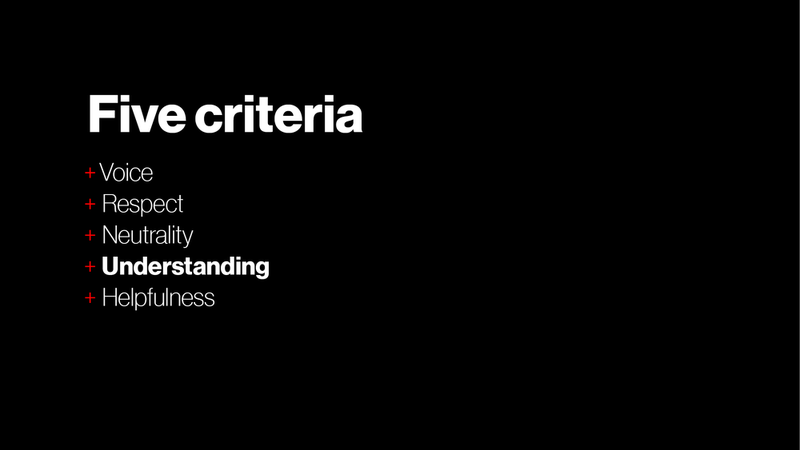 I applied these tenets of procedural justice as design principles to create a digital resource for all court visitors. 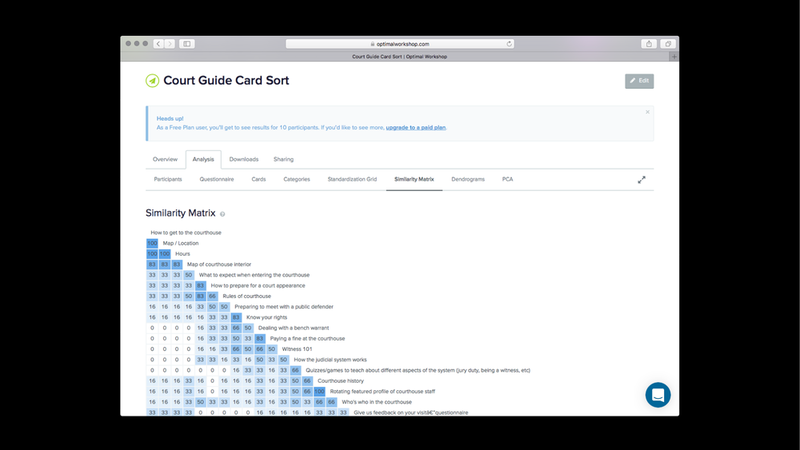 To begin, I mapped the vast content that she wanted court guide to offer, developed proto-personas to explore possible use case scenarios, made paper prototypes to test user flow, and ran a card sorting exercise to validate the information architecture. For the visual design, I used Google’s material design standards and created custom iconography. The app would be created for and published on the Android platform due to its higher accessibility among lower income demographics and open platform. By using the Material Design standards and established interactions, I sought to make the app as easy to program and maintain as possible. I created a UI with simple, friendly graphics and straightforward language that makes the information easy to access and easy to digest. The app invites participation with opportunities for user feedback. 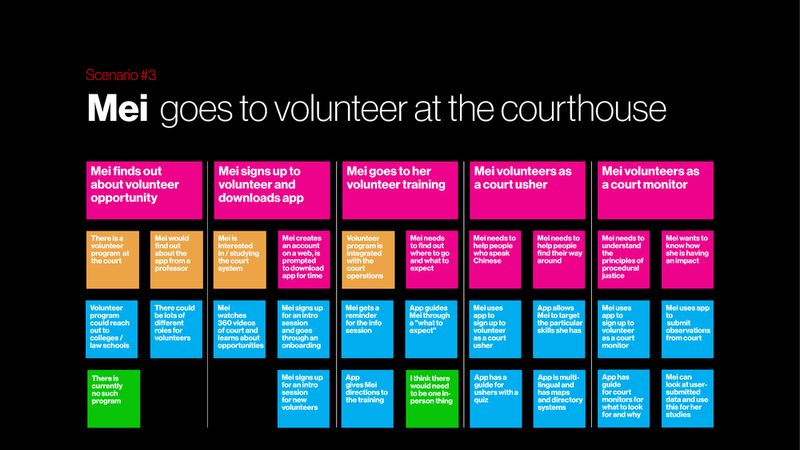 I also used Court Guide as a provocation to think about how courts could enlist volunteers to enhance procedural justice by formalizing and digitizing citizen court monitoring programs.